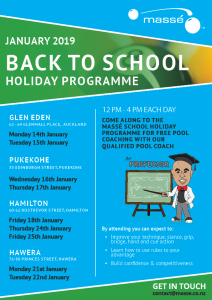 Bring your kids along to the Massé School Holiday Programme for FREE pool coaching with our qualified pool coach Jimmy ‘The Professor’. This School Holiday Programme is a fun programme for kids of all ages! No matter whether your kids have played pool before or not, this is their chance to learn some top tips on cue ball action with our qualified in-house pool coach, Jimmy ‘The Professor’. We run programmes across Auckland, Franklin, Waikato and Taranaki! Improve their technique, stance, grip, bridge, hand, and cue action. Learn the rules of the game and how to use them to their advantage.